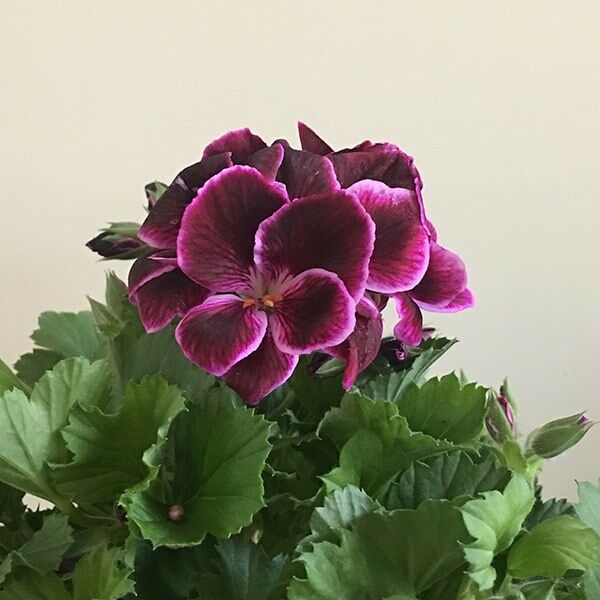 Buy Pelargonium 'Don Valentino' (PBR) regal pelargonium: A tender plant will usually flower non-stop all summer. Rich, opulent almost 'velvet' plum coloured flowers are splashed with tones of a paler pink appear in groups on short stems. Very striking form that lives up to its name as a 'regal' pelargonium adding impact to summer bedding schemes, patio pots, windowboxes and hanging baskets. A tender plant, it will usually flower non-stop all summer, carrying on well into the autumn, usually until it is hit by the first frost. Garden care: Pot up your pelargoniums, but only place them outside in the garden after the risk of frost has passed. Remove the spent flowers as they fade, and keep them well fed using a dilute solution of a high-potash liquid fertiliser (Tomorite is ideal) at regular intervals. If you want to keep them over the winter, move them to a frost free environment and avoid overwatering during the colder months.